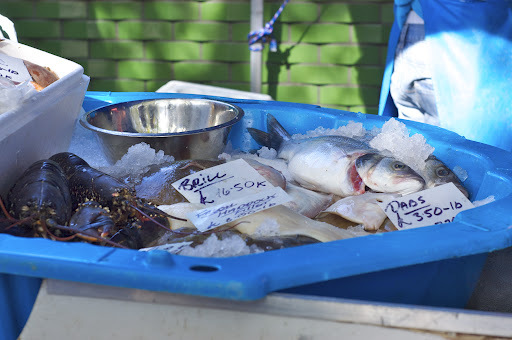 At West Hampstead Market there is Gary’s Fresh fish every Saturday. We have bought fish twice and I would say we made a good deal both time. On last Saturday we arrived there just before closing so most of the goods were sold. 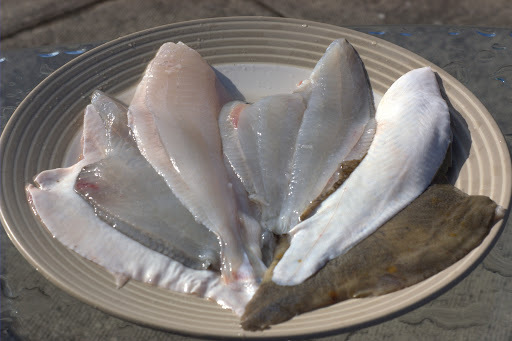 Fortunately few nice flat fish, it called flounder, still waited for us, so we picked them up to make a quick lunch. Melt the butter in a saucepan and add the shallot. Fry the onion over a medium heat until golden and soft. Add the rice, sherry and just enough stock to cover the rice. Bring to simmer and gently cook until all the liquid is absorbed. Continue adding the stock a ladleful at a time, and gently cook. It takes about 12-15 minutes. When the rice is al-dente add the cheese and the finely chopped basil leaves and take it off the heat. 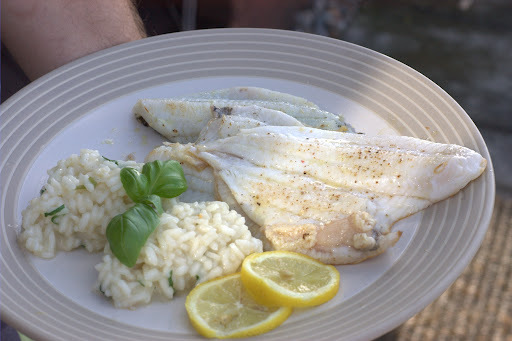 Heat the oil in a frying pan and place the fish in the pan skin-side down, cook for about 3 minutes. Season with salt and pepper.Turn it around and cook for further 1-2 minutes on this side. The fillets will shrink a little bit, it is a normal behavior. Serve with slices of lemon and fresh basil.